Beef brisket, soy sauce, brown sugar, pineapple juice, granulated garlic, black pepper, ginger. There's an immediate sweetness that hits right away, but soon brings on a saltiness. The soy sauce flavor comes on immediately afterwards. Going into the chewing, I don't pick up any natural meat flavors. I can detect a touch of garlic, and every now and then I get a light burst of black pepper. This doesn't really have a teriyaki flavor, it's more of a sweetened soy sauce. That is, I'm not picking up the fermented character that's typically present in authentic Japanese teriyaki, nor am I getting any of the ginger. As for also being named, "Tangy", it's not that much. If anything, it's just really sweet. There's perhaps a touch of tanginess there, but then again, I've had hundreds of brands of jerky, and can be quite critical. Otherwise, it's a very mild tasting jerky, perfect for people with zero tolerance of spicy foods. 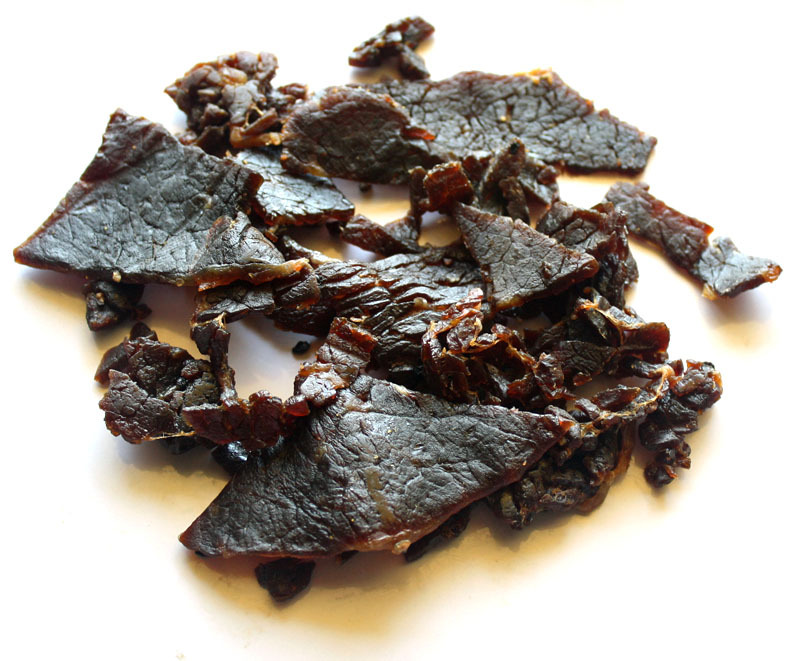 For the most part, it's the sweetness and soy sauce that defines the flavor of this jerky, leaving it largely bland and unremarkable. If this jerky has any redeeming qualities, it's the meat consistency. It's quite tender and moist, and very easy to chew. It lends itself well to feeding gobs of this meat into one's mouth like machinery. 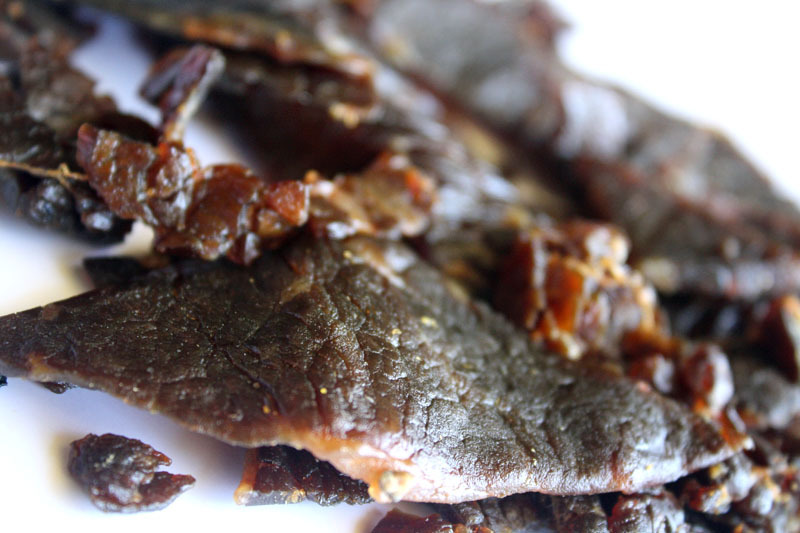 If you prefer a jerky that eats fast, this is it. The chewing texture feels quite mushy and gummy. It doesn't really feel like chewing real beef. I pick up some chewy and stringy pieces, but for the most part it's few and far between. 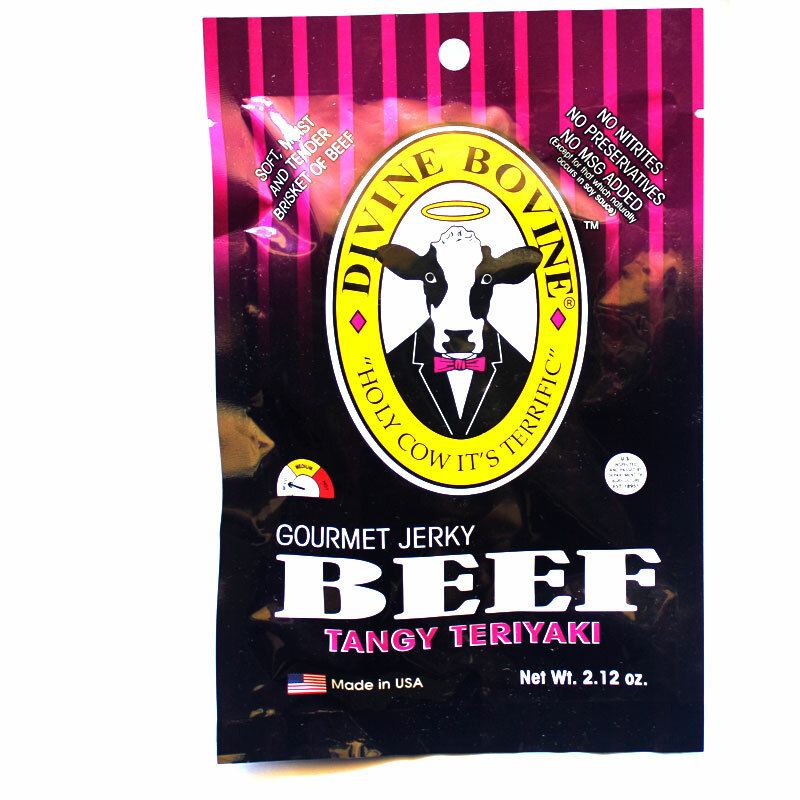 Verdict: This Tangy Teriyaki from Divine Bovine Jerky packs in a lot of sweetness with a good deal of soy sauce flavor. Other than that, there isn't really much else to this jerky. I wouldn't consider this teriyaki by any means, just sweetened soy sauce. The meat is rather mushy and gummy, and doesn't feel anything like real beef. Though, it's still tender and moist, and still registers a fair amount of snackability. This is the best beef jerky I've ever had. They use biscuit as the type of meat which is why it's so tender. I've had a ton of different beef jerky's, but this is by far the best.